When in Singapore you should try your hardest to secure a reservation at Iggy’s restaurant on the first floor of the Hilton on Orchard Road. The best restaurant in Asia (according to the Miele Guide) and number 27 in the S.Pellegrino list of the World's 50 Best Restaurants 2011 (up one to 26 in 2012). Iggy’s is a masterpiece: everything about it oozes excellence. Restaurants are often compared to theatres and artistically arranged fine-dining dishes with vibrant colours and textures arranged in a flourish by chefs with creative vision can be as picturesque as any canvas. On arrival, you are led through a dark wooden corridor into a plush contemporary dining space filled with vibrant artworks. Iggy’s mastermind, Ignatius Chan’s background is as a sommelier and the exceptional wine list is distributed from the central island by the front of house team who glide as fluidly as brushstrokes around the room. The real masterstroke of Iggy’s however is the food – where exceptional ingredients are crafted into works of art in their own right. Our lunchtime show got underway with a stunning amuse bouche featuring a melange of tomatoes served atop a refreshing snow peppered with delicate, peppery flowers. The tiny tomato was a real treat - bursting with flavour. 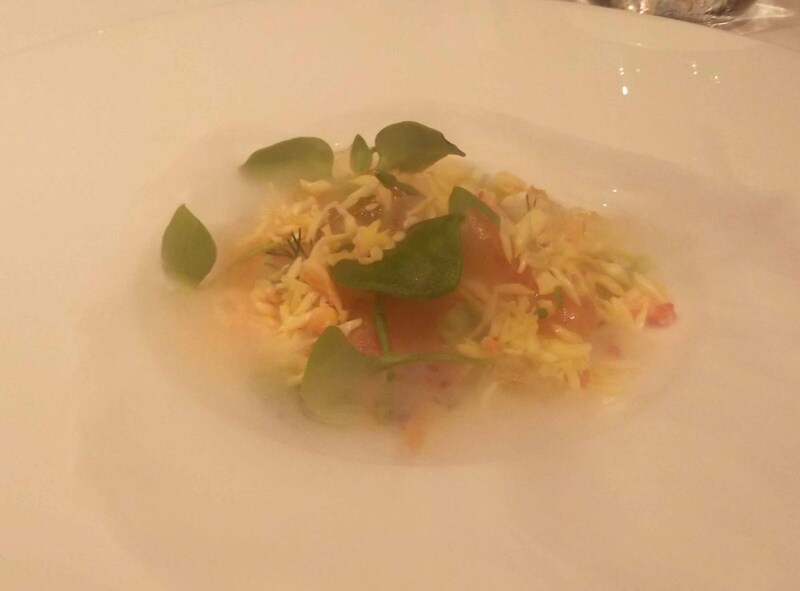 The theatre continued with my starter of Salmon, Savoy Cabbage and Basil Seeds – I’m a sucker for a gimmick and am always wowed by the culinary use of liquid nitrogen; pleasingly, once the smoke had cleared the biggest wow factor came from the best quality smoked salmon that I have ever tasted. 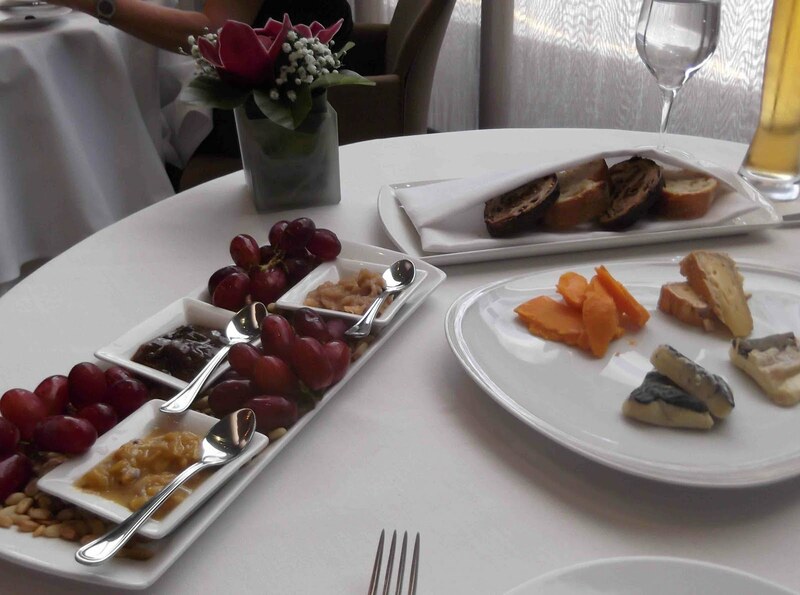 My wife chose the Foie Gras, Figs, Tarragon, Cassis – which she loved. 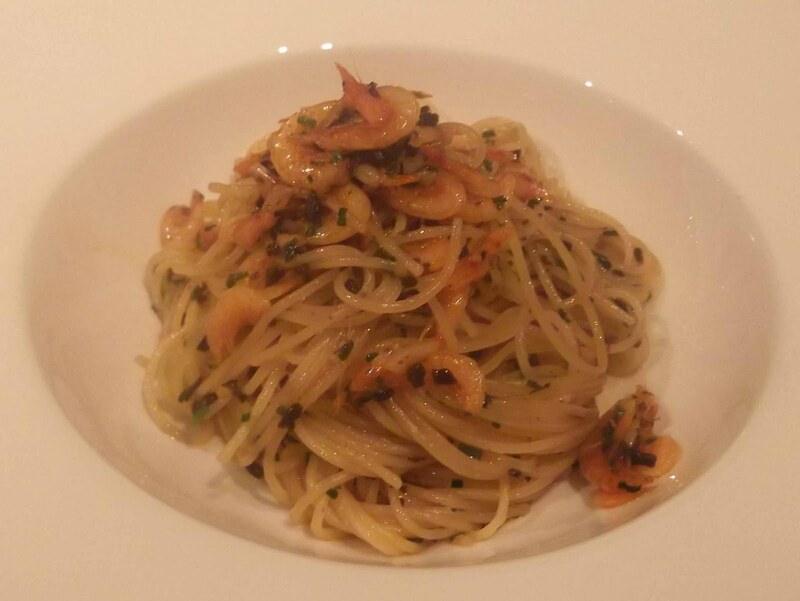 Capellini, Sakura Ebi, Konbu, Scampi Oil – was how the menu described my next course. 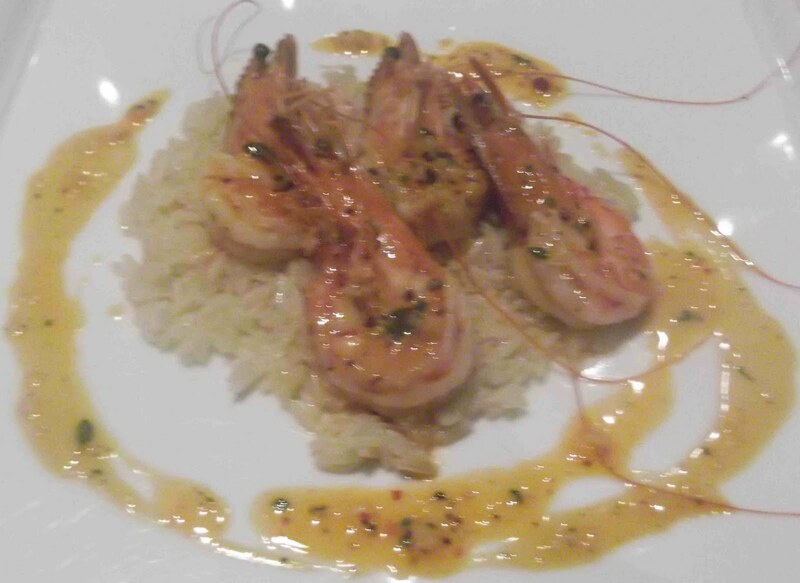 A simple dish, flawlessly executed with phenomenal flavour. The thin strands of angel hair were light and delicate; the crisp Sakura Ebi although tiny were packed with flavour; the konbu and scampi oil dressing was immense! My main course was the Seasonal Market Fish, Fennel, Caper Berry and Pernod – sadly, I can’t remember the type of fish (maybe someone who knows more about them can tell me from the picture) but I can remember the that it was cooked perfectly and complemented by the sweet aniseed flavours of the fennel and pernod and the plump salty caper berry. My wife plumped for the Duck, Carrot, Sesame with Natural Jus – the duck was cooked beautifully and the sesame crust/dust provided both great flavour and an interesting texture. 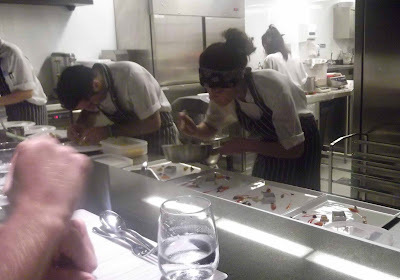 For dessert, we both opted for the Rhubarb, Salted Sable, Vanilla Beans with Blood Orange and moved to the kitchen-side counter seats to watch them being assembled by the pastry chefs. Chatting to the two Americans running this section, we learnt that Tetsuya Wakuda had been in the day before. We also noted that sat along from us were two world-class chefs, Ryan Clift of The Tippling Club and Brent Savage from Sydney’s Bentley. 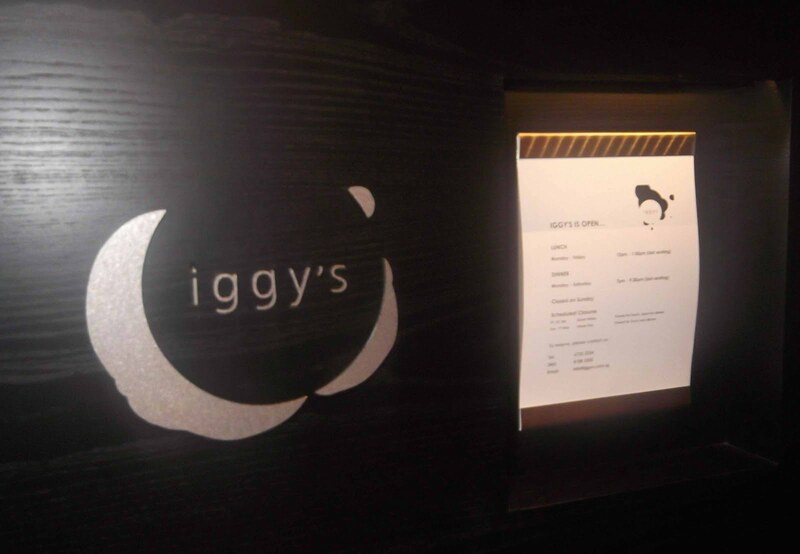 Iggy’s is undoubtedly the place to eat in Singapore. The best restaurant in Asia? I’d say so; the Miele guide says so… go; you won’t be disappointed! An Iggy's take on the traditional Golden Egg (and hammer) that was brought out as s gift for my wife's birthday. Greater Manchester, where I live may have great football teams (difficult for a London born Chelsea fan to admit); renowned museums and galleries and an illustrious artistic and musical pedigree... but sadly, one thing Manchester does not have is any Michelin starred restaurants. (This does not mean however that you cannot find great food in Manchester, as I’m sure future posts will attest). Travel just over an hour in many directions and things on the Michelin front get a little better: Derbyshire has Fischer’s at Baslow Hall; Lancashire has Northcote Manor; Yorkshire has the The Box Tree in Ilkley and the Old Vicarage in Sheffield; Chester has Simon Radley at the Grosvenor; Cumbria has the excellent L’Enclume and the classic Holbeck Ghyll and Sharrow Bay and Birkenhead on the Mersey has Fraiche. Each of these places has been awarded One Michelin Star. 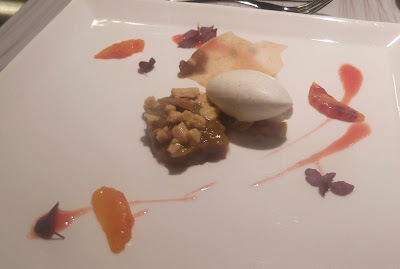 The pick of the crop for me is Fraiche (please note that I have so far only eaten at the restaurants in bold). Fraiche never ever fails to thrill me. Chef-proprietor Marc Wilkinson has created a beautiful setting in which to enjoy his similarly beautiful food. There are five well-spaced tables in a room where covers are kept to a minimum so that the exceptional quality can be maintained. Bookings are taken up to four months in advance and can be made online but you have to get in quick because the small number of covers means getting a table can be tough. 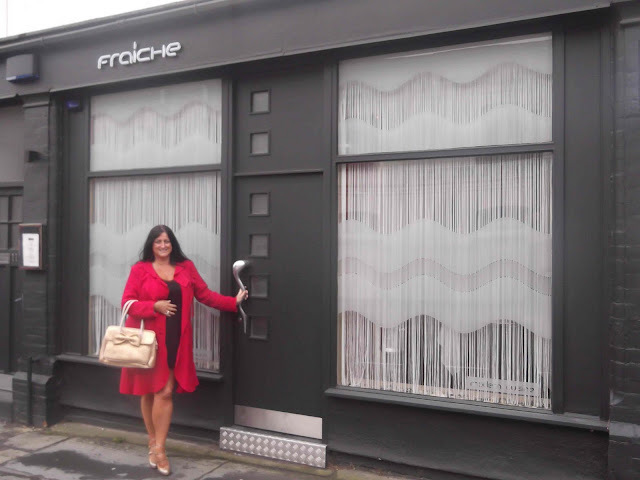 We have eaten there now several times and have taken dining companions who have always been blown away by the plush, yet unpretentious ambience and formal standard, yet relaxed service that is Fraiche! Chef Wilkinson always prepares exciting menus (Bespoke, Elements, Concepts and Signature) showcasing outstanding quality ingredients; prepared using classic and progressive cooking techniques. Fraiche’s Sunday evening choice of menu is the ‘Concepts’ menu, which ‘displays new ideas and reflects the seasonal changes’. Exceptional value at £45, including amuse bouche, breads, mains, desserts and petit fours - expect somewhere in the region of 10 to 12 courses. Most definitely a treat for anyone interested in new flavours. Our experience began this week with delicately spiced pecans – a Fraiche favourite. Followed by a chorizo sandwich - a wafer thin toast, topped with a savoury jelly and chorizo dust. The next course was simply divine. An artistically arranged array of vibrant greens and reds, which certainly wowed as it was brought to the table. 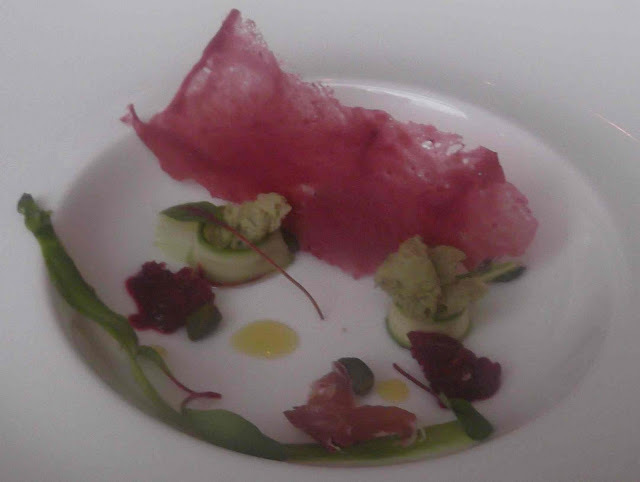 The beautiful and texturally diverse dish featured: delicate ribbons of finely sliced asparagus; a beetroot sorbet, which added freshness in addition to a pleasing temperature contrast; a dehydrated pistachio ‘sponge’ which added yet another interesting texture and a cherry tuile, which added drama to the dish and helped to hide the pleasant surprise of a delicious fresh cherry which was nestled behind. 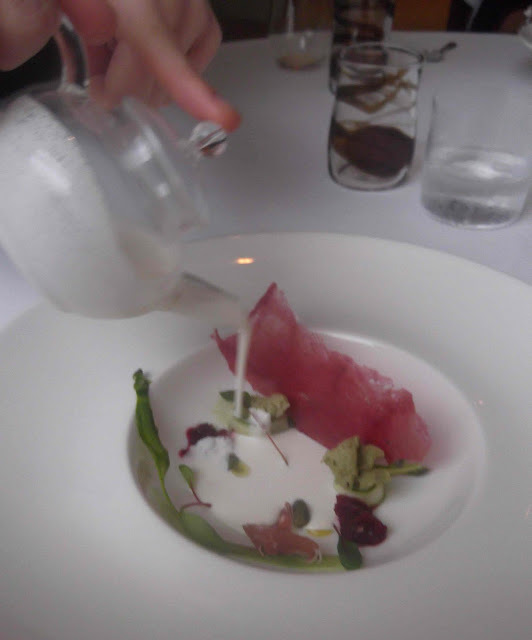 A chilled almond soup (poured from a cute little glass teapot) finished the dish. 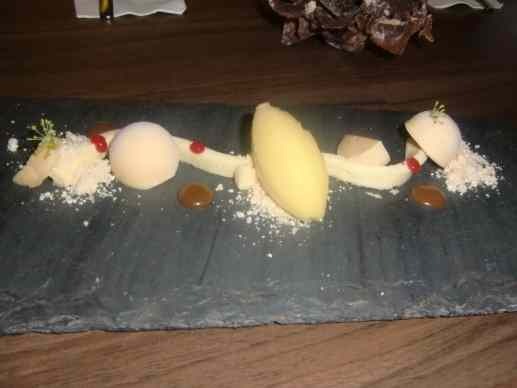 Great flavours, great presentation, great textures – a quintessential Fraiche work of genius! 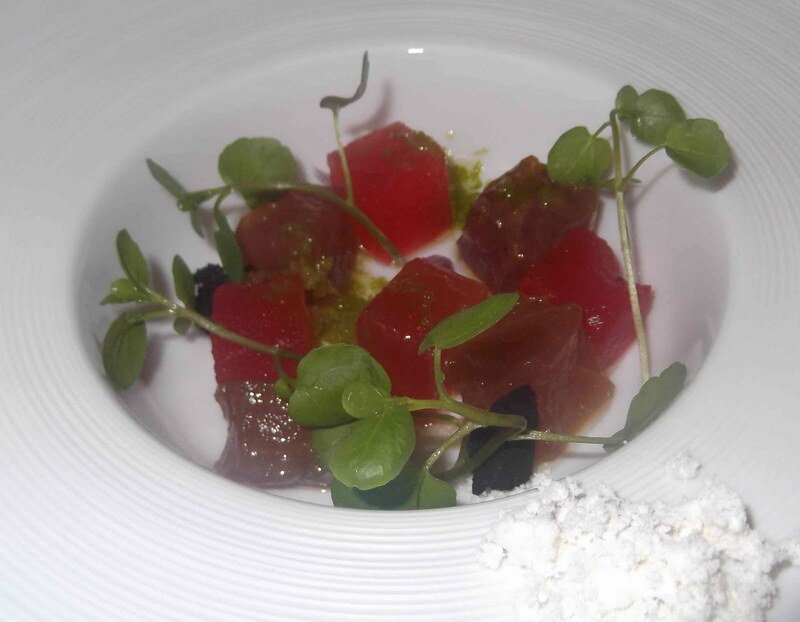 Following a selection of some of Marc’s gorgeous breads came another outstanding offering: cubes of marinated sashimi of tuna; crisp juicy watermelon; pea shoots and more progressive techniques and textural treats in dehydrated olive oil and ‘charcoal’. More breads (including my personal favourite, flavoured with treacle and my wife’s favourite, with cranberry and caramelised onion) were followed by the fish course. It is always gratifying to see more and more restaurants using environmentally sustainable fish and my first taste of ‘Char’ did not disappoint – deliciously moist flaky fish with a subtle sea trout like flavour. 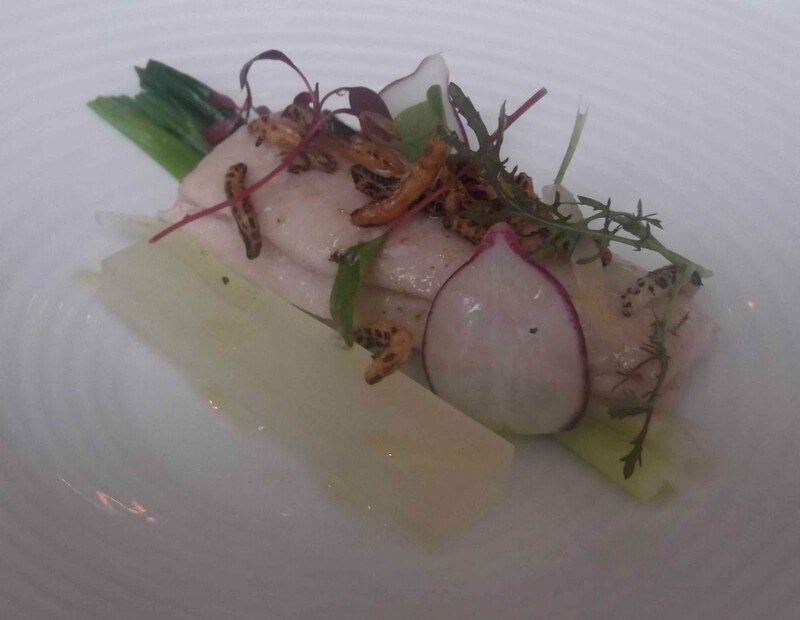 The char was served on a bed of baby leeks with a yuzu gelée and another Fraiche signature ingredient, puffed rice. 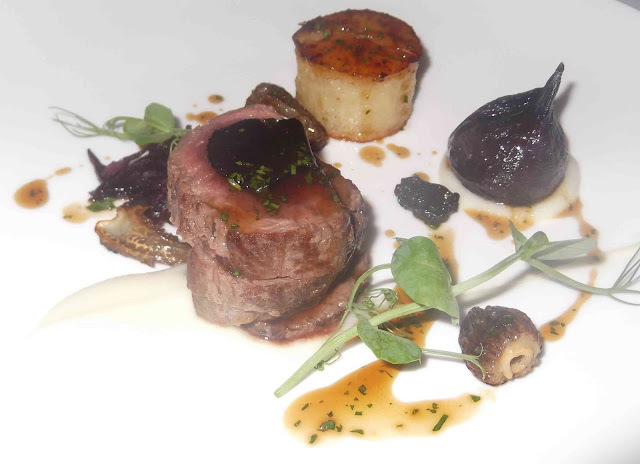 Some of the best venison I have ever tasted was up next topped with a slice of truffle, morels, roasted shallot and fondant potato. Fraiche’s cheese chariot usually carries and impressive selection of artisan cheeses. 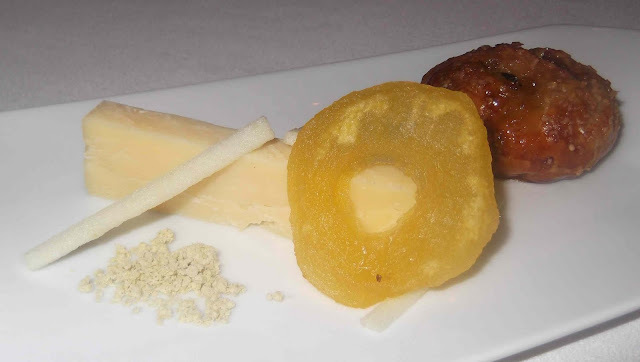 Tonight’s cheese course however was a whole new approach: a quality cheddar; crisp matchsticks of apple; dehydrated apple; pistachio dust and to complement the cheese, an imaginative twist on chutney, a perfectly executed bite size Eccles Cake – flaky and fruity, sticky and sugary. The usual Fraiche cheese chariot. Fizzy grapes followed: another Fraiche favourite. 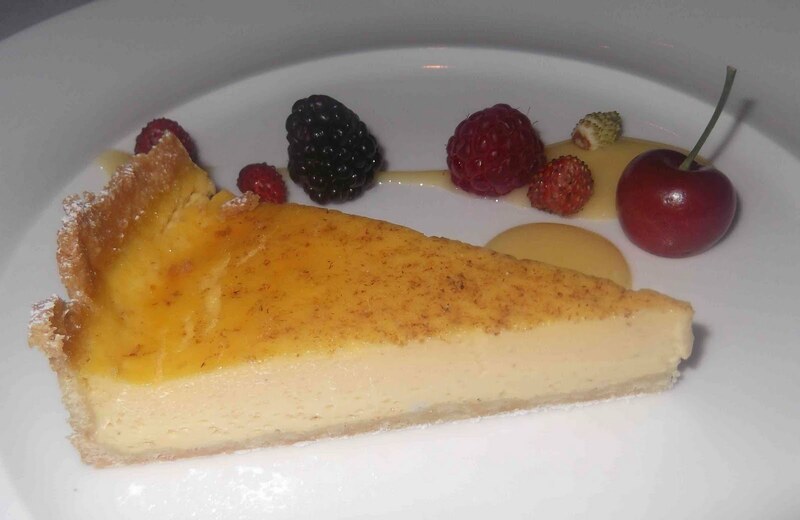 Then, an unusual divergence from the typical creative Fraiche desserts came a classic English Custard Tart with fresh berries and lemon sauce. Classics like this leave no room for error and have to be impeccably executed – this one unquestionably was, a thick wobbly, filling and unparalleled pastry. Very accomplished cooking. All in all, Fraiche is simply fantastic! Imagine a bar that exudes coolness. A bar where the hip, chic and switched on people hang out. You might be imagining plush white leather seats; modish lighting; trendy staff; chilled champagne and the latest tunes playing in the background… Easy to imagine as places like this exist in every cosmopolitan city across the globe? Sounds too good to be true? 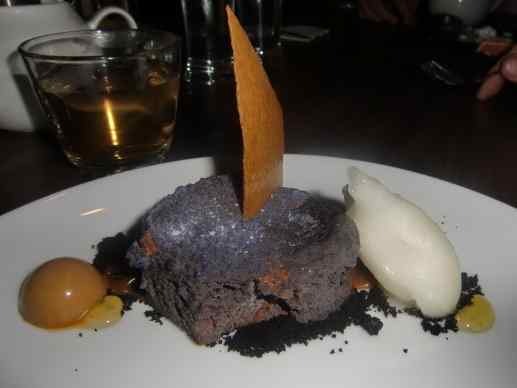 Well thanks to the remarkably gifted chef-owner, Janice Wong, the ‘2am:dessertbar’ is very much a reality. ‘POPCORN’ sweet and salty, yuzu (paired with a Prophet’s Rock Pinot Gris) – Served in a sweeping wave on an in-vogue black slate; this was my favourite of the desserts that we tried as it really captured the salty and sweet flavours of cinema fresh popcorn. ‘ARAGUANI H20’ valrhona chocolate 72%, Evian, caramel mousse, praline, yuzu sorbet (paired with a Tempranillo, Ribero Del Duero). I love Yuzu, which is an ingredient with a unique citrus zing that is rarely readily available in the UK and I love sorbet… oh, and I adore great quality dark chocolate. 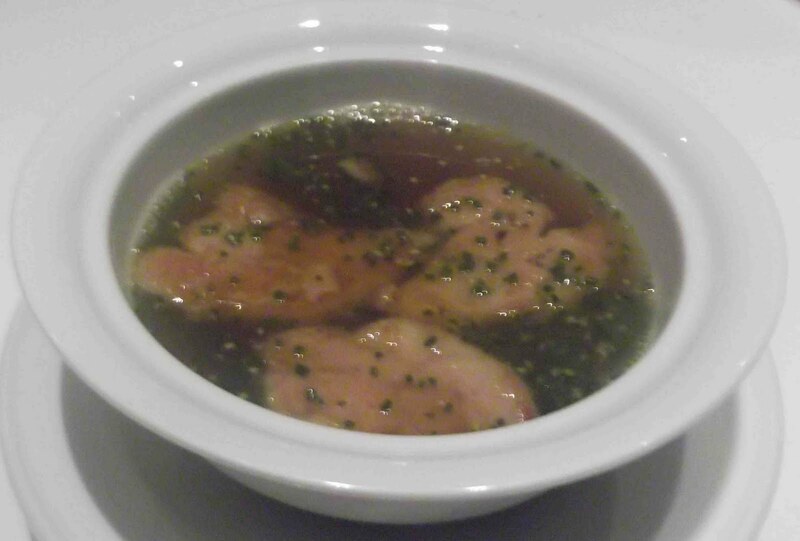 For me, this dish was always going to be a winner! 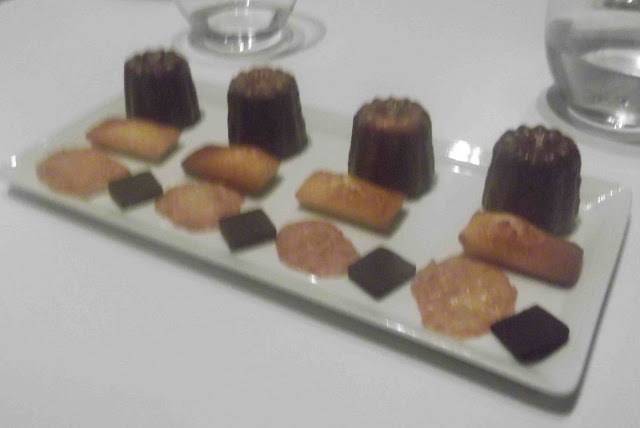 The presentation wowed and the texture combinations enhanced the eating enormously. ‘GUAVA CLOUD’ elderflower, starfruit, sweet milk sauce (paired with a Verdejo). 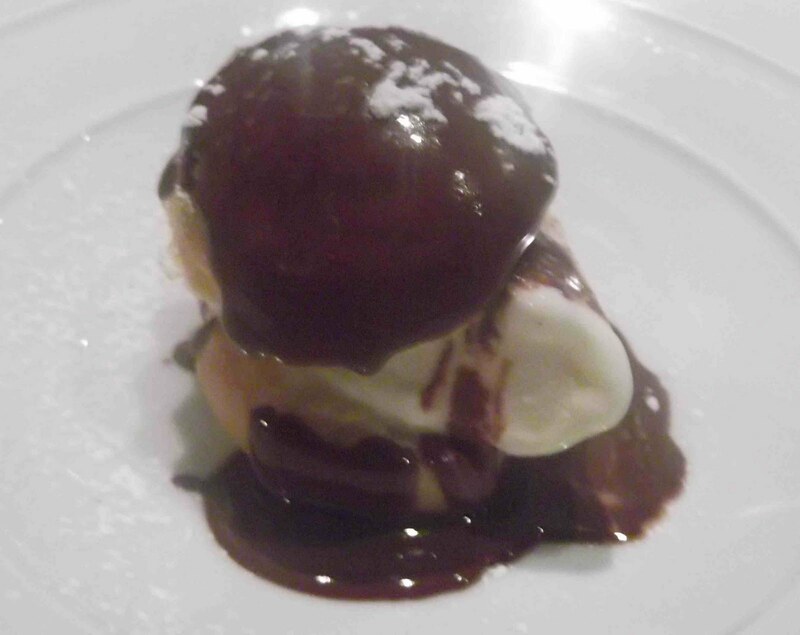 - Light and refreshing, sweet and ambrosial, this was one cloud that could unquestionably be described as heavenly. The starfruit added a subtle sour crunch that perfectly complemented the other clean flavours. Each of the dessert dishes on the menu is accompanied by a quality wine paring. Alternative pairings were ably suggested by the Bar Manager who had an extensive selection of ‘off menu’ drinks, including Hitachino Nest Beer, from Japan. Creative cocktail pairings would however, be a welcome addition to the menu and overall experience. Janice came out to chat and arranged for some delightful fruit jelly shooters; a quirky surprise that were as fun and enjoyable as they were flavorsome. Quiet and unassuming, the young and talented owner is the perfect deferential host. Her food may be theatrical but Janice lacks any pretension in the presentation of her food and herself. I have two regrets in relation to the 2am:dessertbar. The first is that our visit was the week before they played host to Master Pastry Chef Rosio Sanchez, from Noma - the World’s Number One Restaurant. This would have been an amazing opportunity to experience the exceptional talent food of Copenhagen’s leading-edge food in 2am’s cutting-edge setting. The second is that I live in Manchester and not Singapore. The bad news is that I will probably not be returning to Singapore until next year. However the GOOD NEWS is that Janice and her 2am:dessertbar staff will be coming to London’s Southbank from the 9th to the 11th June 2011 as part of Singapore's International Culinary Exchange SPICE programme. I will be there. Following our first foray into French cuisine in Singapore at Les Amis we were keen to try two other restaurants that we had heard good things about: Gunther’s Modern French Cuisine and Cocotte. Aside from both serving great Gallic grub these two restaurants could not be more different. Cocotte’s website informs you that they serve up, ‘unpretentious, rustic French cuisine in a casual and comfortable setting.’ Here, French country cuisine is best shared around a large table of family or friends. By contrast, Gunter’s website draws your attention to their ‘warm, elegant, almost gallery-like space’ and ‘iconic furnishings’ which aim to set the mood for appreciating the seasonally updated menu, boasting gourmet cuisine using some of the world’s finest ingredients. We booked Gunther’s on the strength of their positioning as the 84th Best Restaurant in the World in the 2010 S.Pellegrino list. 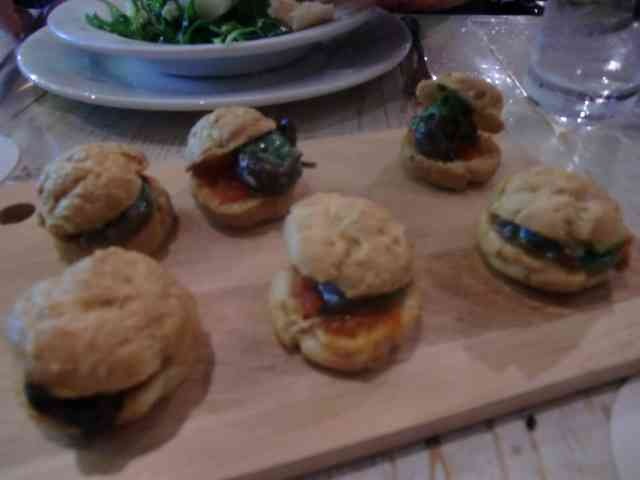 Although, they had been ousted from the top 100 in the latest version that came out the week before we dined. I suspect that this drop in rating is a result of all the new entries and other restaurants raising their game and not due to any decline in quality of the product since the previous year. 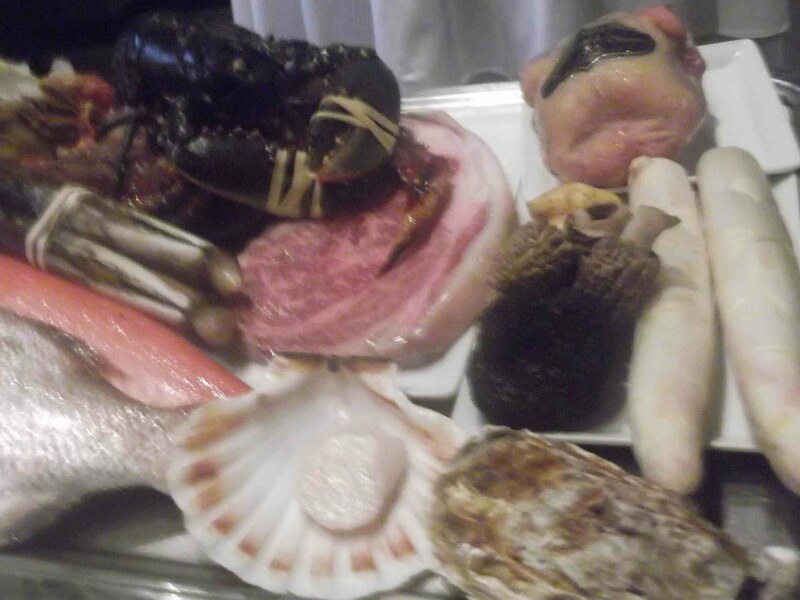 Along with the menus we were presented with a board showcasing the finest examples of some incredible ingredients such as fresh fish and seafood, grade nine Wagyu, quail, morels, asparagus and a live lobster. Amazing as these luxuries looked, we opted for the incredibly good value set lunch menu as we were nearing the end of our holiday and after two weeks of indulgence the budget was starting to get tight. 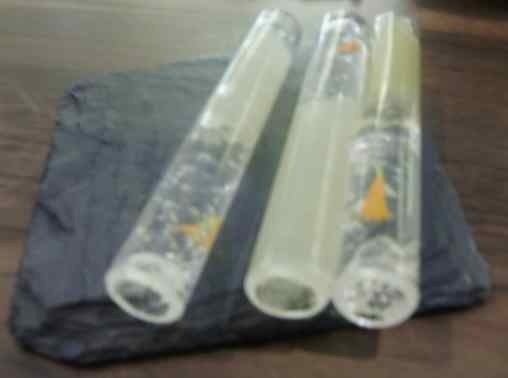 I opted for the Smoked salmon, blinis; my wife went for the French potato salad, egg confit and Swiss bacon but the star starter was the Poultry consommé with roasted foie gras that our dining companions both selected. Portions were generous, and the quality of the ingredients shone though in the flavours. 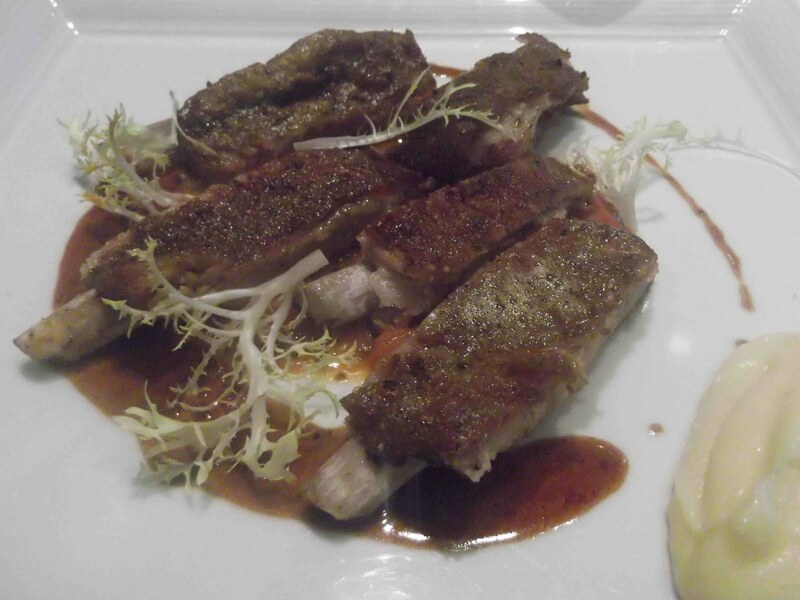 Meltingly tender pork ribs with velvety smooth mashed potatoes were the stars of Gunther’s creation - the surprise element of the set menu which changes daily. Tagliatelle pasta, Provençale style was the preference of the last of our party and I regret not tasting this. 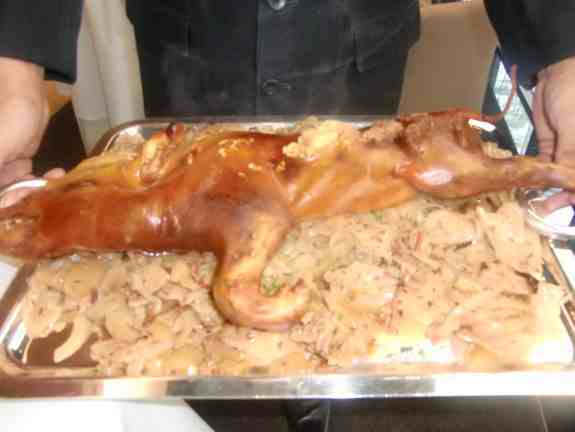 Chef Gunther Hubrechsen paid a visit to the dining room once the mains were out. This was an appreciated personal touch and it was gratifying to be able to pass on our admiration for the food that we had just eaten. Smooth ice cream, chocolate sauce and choux pastry made for a delightful take on the profiterole (sans cream) that was Gunther’s Dessert of the day. The French food theme was continued with our evening meal at Cocotte. Here we ordered, what seemed like, half of the impressively authentic rustic French menu. More choux pastry but this time in my starter: one of their signature dishes: Escargot gougères with Parsley cream, tomato coulis in Gruyere pastry. Navarin d'agneau printanier: Stewed grass-fed lamb shoulder with a mix of fresh baby carrots, new potatoes, fava beans, pearl onions & peas. Fried Tripe: Slow cooked till tender & coated in crisp breadcrumbs. Pig’s Trotter: Crispy medallions of tender, boneless pig trotters. Served with arugula & pistachio dressing. One dish that did not go down well with two of my dining companions was the ‘Moule Frite: Air-flown live French bouchot mussels. Cooked in a light apple cider cream sauce & served with fries.’ They both said the cream sauce tasted sour – although, I tasted it and enjoyed. 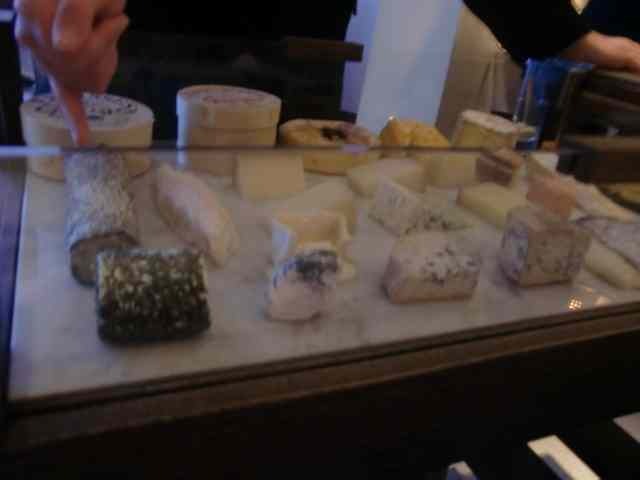 We followed our meal with a cheese board to share, which had a limited but good quality selection of French cheeses. 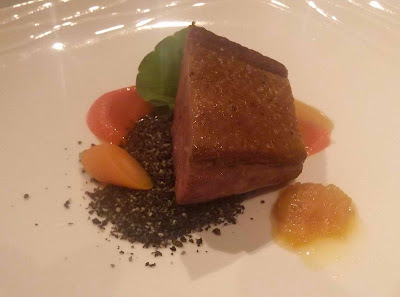 All in all, thanks to Les Amis, Gunther’s and Cocotte, my impressions of French food in Singapore… c'est magnifique! What are your favourite restaurants in Asia? Having just checked the Miele Guide website, I noticed that there are only a few days left to cast votes in favour of your most loved Asian restaurants in the hope that they will be featured in the 2012 edition of the indispensable little red book! Obviously, I only voted for restaurants at which I have dined. 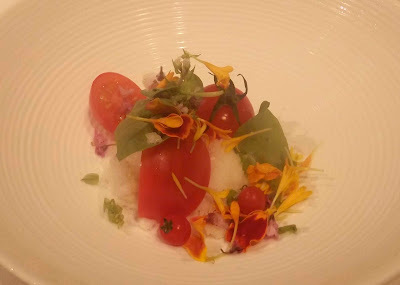 On my recent first trip to Asia I managed to eat at six of the current Top 20 in the Miele list and a good few others that also get mentions in the guide. Planning further adventures in Asia to experience glorious food and wonderful culture is high on my agenda. Les Amis is a French restaurant in Singapore, which serves contemporary European cuisine by Austrian Chef Armin Leitgeb. Before you give it any thought, it is natural to assume that the best French restaurants are found primarily in France. 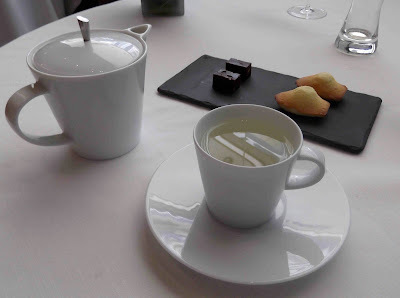 However, with restaurants such as Per Se, The French Laundry, Daniel, Guy Savoy and Le Bernardin in the USA; Le Gavroche, Le Manoir aux Quat' Saisons, Alain Ducasse and The Waterside in the UK; not to mention the various restaurants that the likes of Pierre Gagnaire and Joël Robuchon have dotted around the globe, you soon fathom that fabulous French food can be found worldwide. 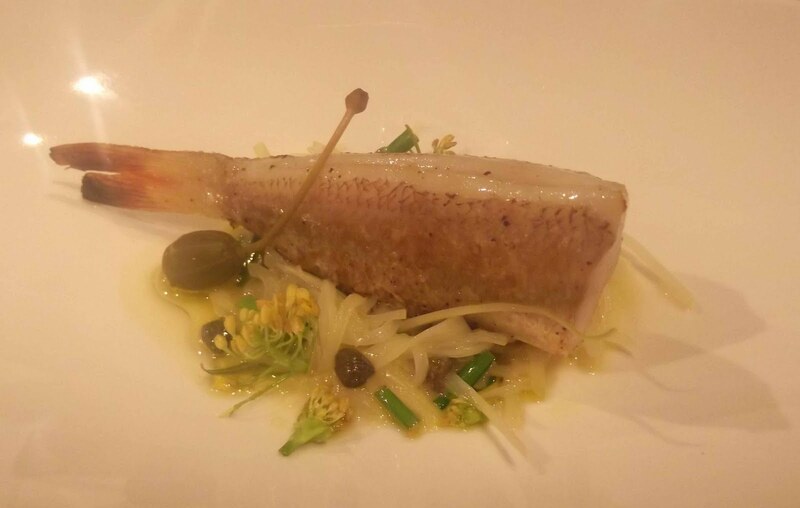 Whilst in Singapore, we dined in three excellent French establishments. Gunther’s Modern French Cuisine, Cocotte and Les Amis. Les Amis is certainly the most celebrated of the bunch. Established in 1994, it has won numerous awards for both its food and for the S$5 million wine collection it houses. When we made our lunch booking, Les Amis was listed as 78th Best Restaurant in the World in the The S.Pellegrino World's Best Restaurants list. The 2011 list came out the day before our reservation and we eagerly waited to see if there would be any change to its position. 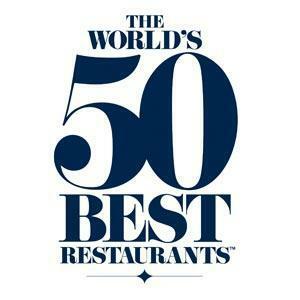 Much to our delight, a climb of twenty-three places now ranked the restaurant the world’s 55th best! “Well, was it the 55th best in the world?” was the first thing that my stepson asked as we met him outside after our meal. As I haven’t (yet) dined in all the top 54, I can’t give a definitive answer. However, I have dined in six of the top 100 (and I am booked into another three next month) as well as a number of Michelin starred restaurants that are not in the list, so I can certainly offer my opinion based on these experiences. It would be unfair to compare Les Amis to The Fat Duck, WD-50, Momofuku Ko or Ssam Bar, which present enormously different dining encounters. 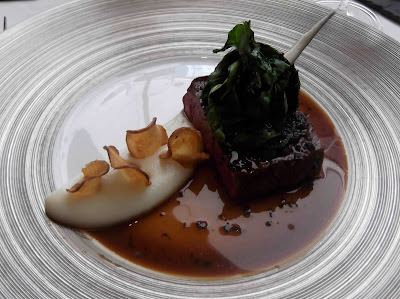 So, for me, I would say Alain Ducasse at The Dorchester is better but Les Amis is on par with Jean Georges in NYC, both of which have three Michelin Stars. We opted for just the 3 course lunch menu as we knew we had a big meal planned for later in the evening. 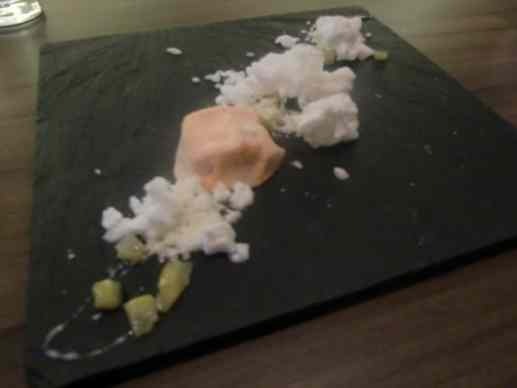 Although, as it was one of my main reasons for choosing to dine there in the first place, we did also go for the supplementary cheese course. 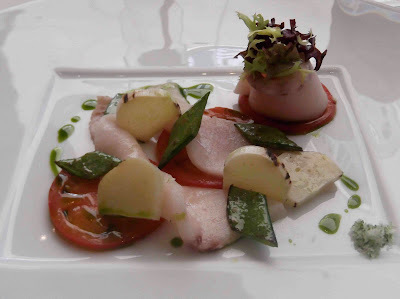 Marinated swordfish, fruit tomatoes, hearts of palm and lime salt was my choice of starter for the day. The swordfish did not disappoint and the summery flavours which accompanied, made this a perfectly refreshing and summery dish. It was my first time tasting hearts of palm or 'Millionaire's Salad' and the subtle artichoke flavour enhanced the dish. The lime salt was the star of the show for me - I just regret giving too much of it away on the forkful that I prepared for my wife. Marinated swordfish, fruit tomatoes, hearts of palm and lime salt. My wife opted for one of Les Amis’ signature dishes, the Lightly smoked eel “tiède” crispy pork crouton, horseradish and Dijon mustard emulsion; a clever dish and beautifully presented. I too love eel and would have chosen this if she hadn’t got in there first (we rarely choose the same) although, on reflection, I was definitely happier with my choice. Spoiling ourselves was the theme for our mains. My wife opted for another signature dish, the Crispy suckling pig, cabbage “speck” potatoes and caraway (supplement of S$15.00) and I had the, Char – grilled Wagyu rib eye cooked in hay, sunchoke, spinach and sauce Périgourdine (supplement of S$25.00). You can only imagine the expression on her face when the whole little piggy arrived on a mountain of cabbage. 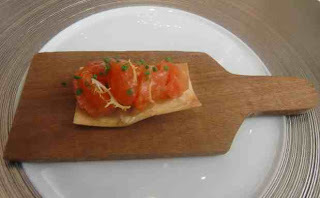 I certainly had my eye on its little crispy ear which looked a treat. The wait staff soon returned with a much more manageable portion and my wife gave me her trotter, which, although not the ear I was hoping for, was still very welcome. My Wagyu was outstanding. The ‘sunchoke’ (Jerusalem artichoke) mash was deliciously velvety and the glossy truffley sauce completed the luxuriousness of the dish. Cooking in hay is an ancient method that is coming back into vogue. Perhaps my palette is not as refined as some – you are supposed to get a ‘grassiness’ from the hay – I could just taste meat, albeit an amazing bit of meat! Char-grilled Wagyu rib eye cooked in hay. The Cheese Selection of Maître Affineur Bernard Antony did not disappoint. The plentiful medley of nuts, fruit chutneys and bread, including a fig-heavy, rich fruit bread made for an interesting alternative to the usual condiments. 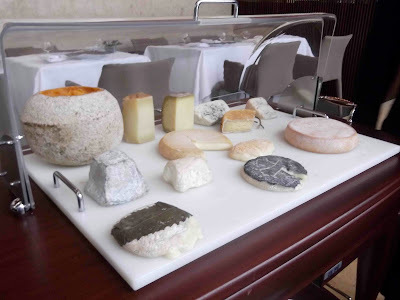 Cheese selection of Maitre Affineur Bernard Antony. A great selection of nuts, fruits and breads. Service was swift and efficient; our glasses were never empty. This, I’m sure, was helped by the fact that they were not very busy to say the least - there were just three couples in the main dining room and at one point I counted seven members of staff on the floor. Les Amis is a classy place but pricey place. I’m glad we went but will not rush to return there the next time we are in Singapore. This is no slur on Les Amis… a wonderful and inviting place with excellent food choices, simply that there are so many restaurants in Singapore that we have yet to try. As I have mentioned in my previous posts, I have just returned from a trip to Singapore. If I had to sum Singapore up in a few words, those words would be: breathtaking architecture, lush greenery, outstanding cleanliness, endless shopping and food. Definitely food! Singapore has some amazing food. The delights of the Hawker Centres I have already told you about. The many malls of Orchard Road are literally awash with food halls, serving a rich and plentiful array of international cuisines. Alongside stores such as Cartier, DSquared2, Louis Vuitton and Prada the architecturally, technologically stunning and wonderfully, funky shaped “Ion Mall” alone has a food hall containing somewhere in the region of eighty food stalls and numerous restaurants. 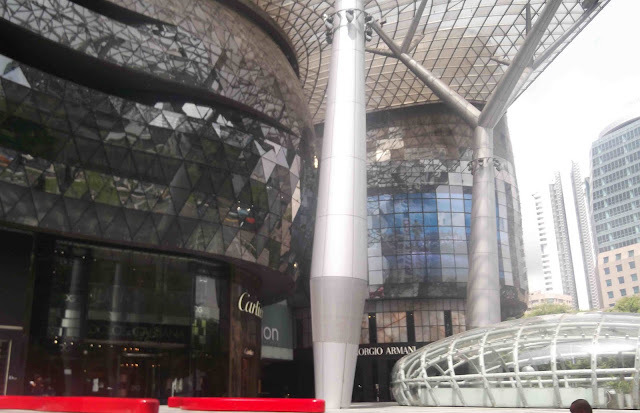 Ion Mall: one of the finest of Orchard Road's many malls. The city’s cultural centres of Little India, Chinatown and the Kampong Glam area around Arab Street are also must visits for those hunting for the finest flavours and authentic foodie fare. 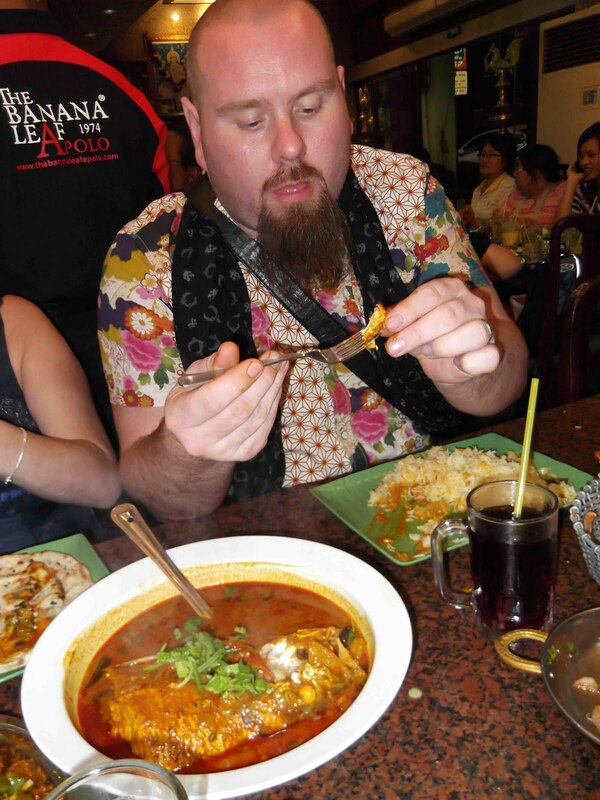 Fans of eating heads should head (pun intended) to Little India for the Fish Head Curry and to Chinatown for the heads of ducks – I say heads, you’ll definitely need a large number of them if you are intending to fill your tummy as they do not offer much in the way of sustenance. Spend some time sucking and slurping on the beak to savour the lightly spiced seasoning and then split it open to scoop out a fingertip full of deliciously smooth and creamy brain. Fish Head Curry: a Little India special. 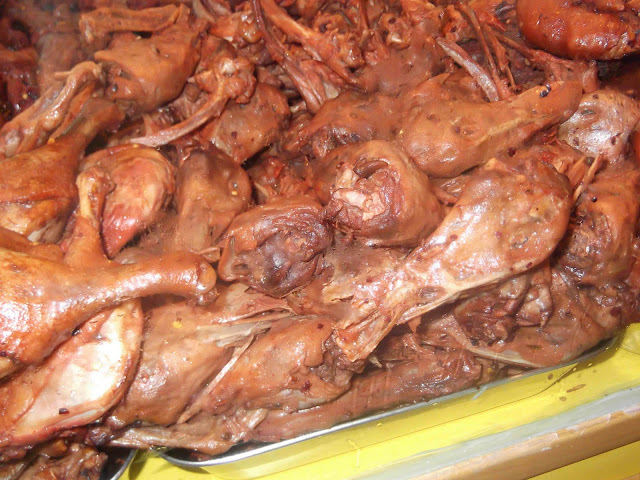 Duck heads: one of the local flavours found in Chinatown. Those of you searching for a more formal dining experience are in luck - Singapore has an abundance of world class restaurants including eateries by some of the biggest names in gastronomy, such as Tetsuya Wakuda, Daniel Boulud, Santi Santamaria, Wolfgang Puck, and Guy Savoy all within the Marina Bay Sands complex. Marina Bay Sands (centre) hosts eateries by some of the biggest names in gastronomy. My wife and I visited Singapore primarily to visit her son and his girlfriend who live and work there. 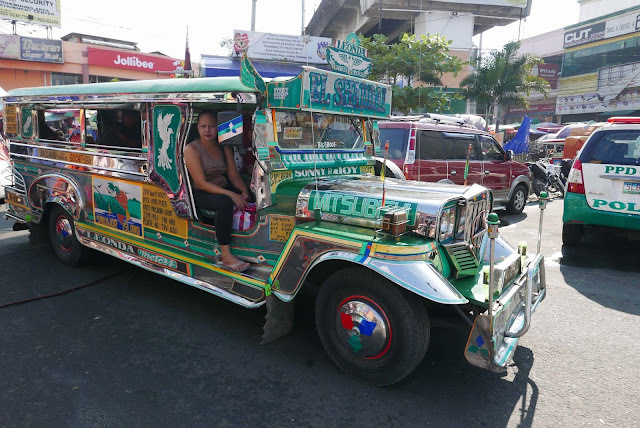 We were only in town for eight days in total but thanks to their local knowledge and planning we were able to secure reservations at some of the finest and hippest places in town. 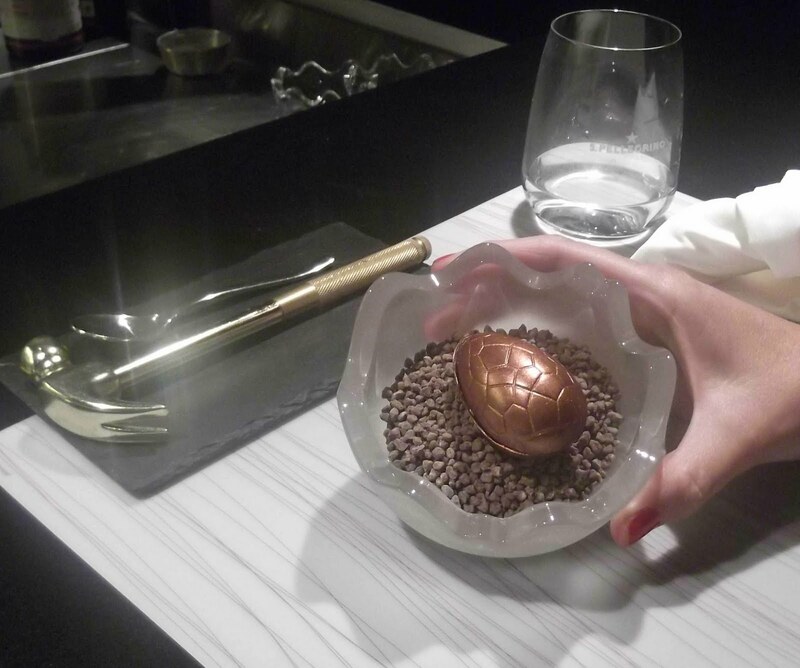 Over the next few days I will be posting in more detail about the splendid gastronomic experiences we had at Iggy’s, Les Amis, The Tippling Club, 2am:dessertbar, Gunther’s, Wild Rocket, Cocotte and more. Unfortunately, I will have to wait much longer for my next trip to Singpaore before I can write about the numerous other restaurants on my list of those I wish to visit, such as: Jaan, Andre, Blu, Goto and FiftyThree.